The East River Animal Hospital has been serving clients and their pets in Pictou County and surrounding areas for over 25 years! During the past 10 years Dr. Kathryn Finlayson and her staff have expanded services into a full service veterinary facility which includes a pet retail store, on site luxury pet boarding (for cats and dogs! ), an entire surgical dental suite, a complete double surgery bay, on site ultrasound, in clinic laboratory services, a compassionate palliative care room and much more! State of the art equipment is continuously updated, and all of our staff are required to attend mandatory continuing education. Your pets will receive the best care in our newly updated beautiful facility. We encourage everyone to come in and see our brand new facility! 24 hour emergency service is available on site! 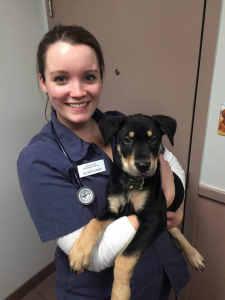 The East River Animal Hospital welcomes Dr. Jessica Muir to our team! Dr. Muir grew up in Bridgewater, Nova Scotia and has always dreamed of becoming a veterinarian. Dr. Muir received her Doctorate of Veterinary Medicine in 2016 from The Atlantic Veterinary College in PEI. Following graduation, Dr. Muir worked briefly in her hometown before moving to Pictou county with her husband to continue her career as a small animal veterinarian. Now Open Until 8PM Tuesday and Thursday! We have extended our hours to provide the best care possible! Click the ZipWhip icon at the top to get started! For emergencies, please call (902) 752-6655.